Last year, I posted about a few new things I used in class for the 2014-2015 year. You can see those ideas here. 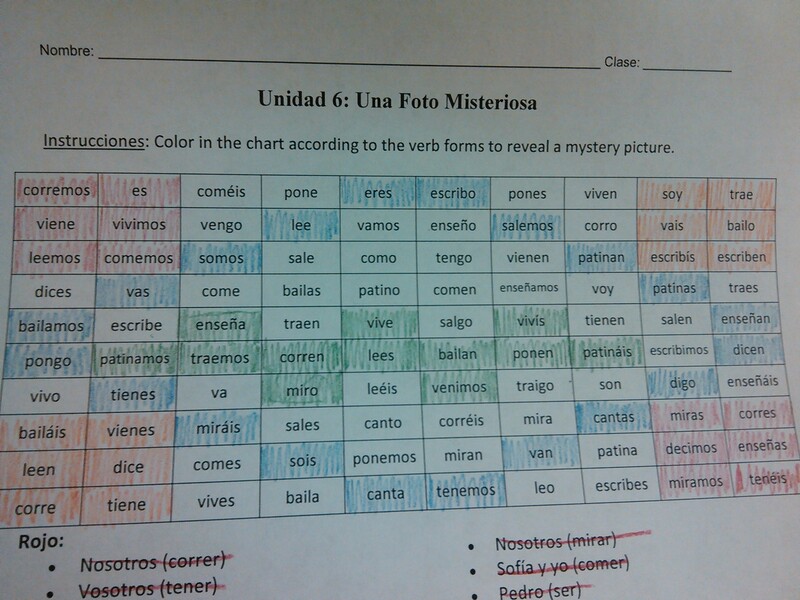 My favorite of those new ideas I implemented last year was the entiendo/no entiendo chart. I really LOVED being able to get a quick glance of how the kids felt after class was over, and they really easily got into routine and would even move their magnets when they had a sub. Check it out if you haven’t seen it yet. For this school year I moved into a new room. The only bad thing about that new room is that it doesn’t have windows. 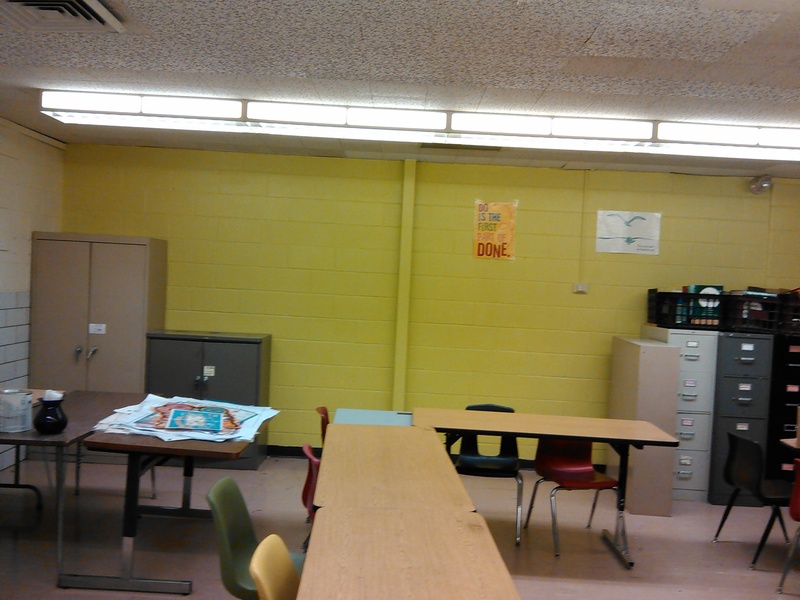 Every time I would walk into the room, all I saw was dull, blah colors. 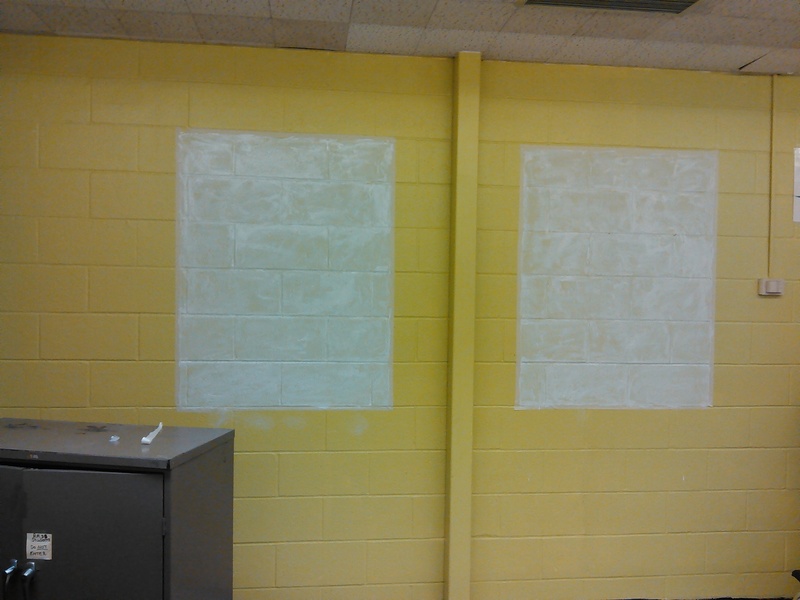 I was trying to ponder ways to bring some life and creativity to the room, and one of the solutions I came up with was to paint windows on the back wall. After getting administration’s approval, I worked with the art teacher to recruit some of my kids/her art students to volunteer to come in and paint something for me. 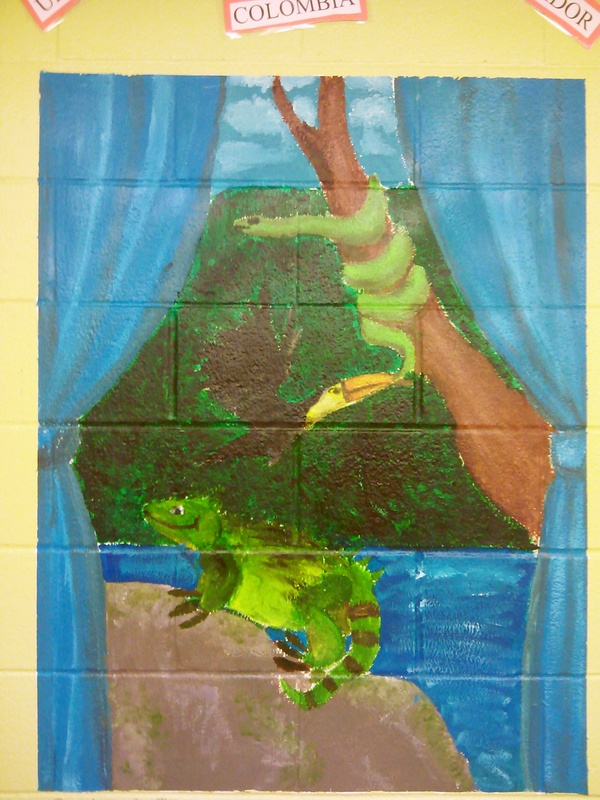 I thought that painting windows would be a creative fix, but I left what was actually painted up to the students themselves. I am really impressed with how everything turned out. 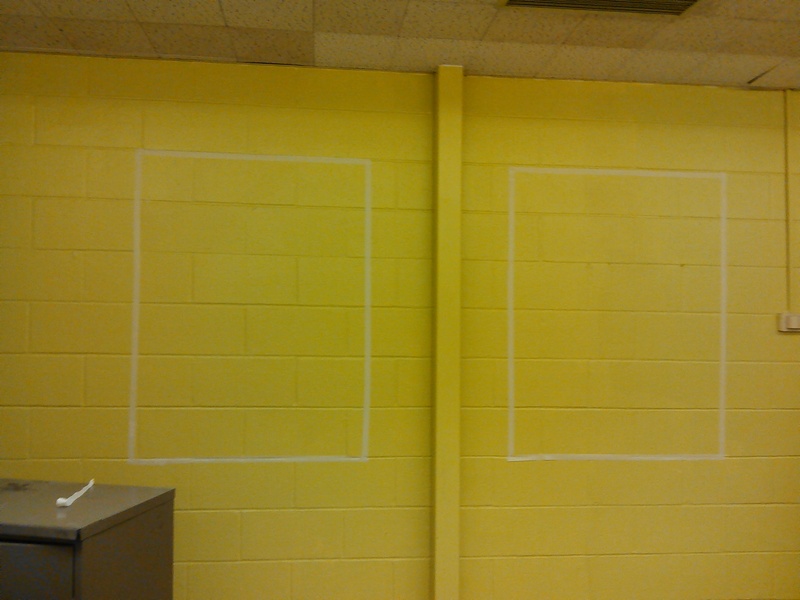 The outline of where the windows will be painted. 2. 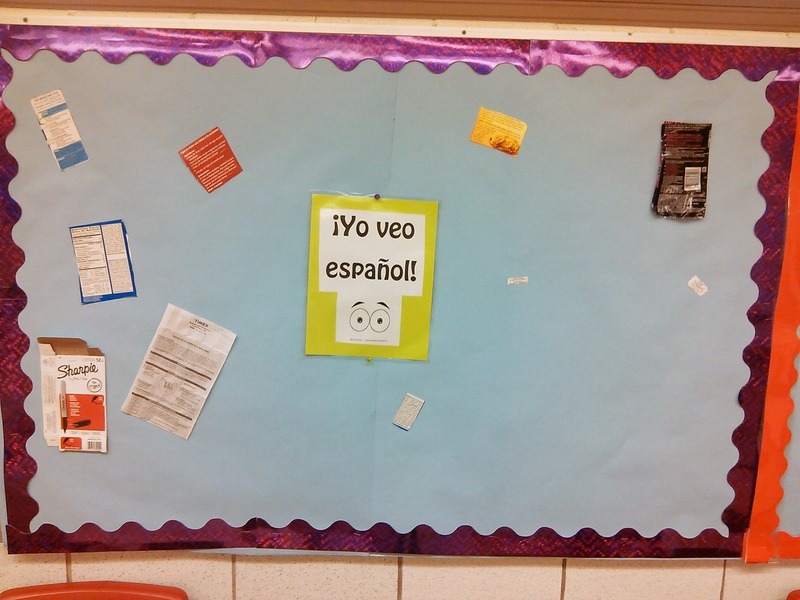 “I see Spanish” wall. As part of my students’ homework for week 1, I asked them to bring in a label/instructions/sign that they found around their house that is written in Spanish. Since it’s only day two and not all students have turned in their homework yet, the picture below just reflects a few items. I will update in a week or two with another picture. I created this coloring activity for my students. I titled sections with colors (rojo, verde, etc.) and they had to color the verb according to the conjugation. 1. Good with any verb tense: While I used this for the present tense, you could easily adapt this for the future, past or whatever. 2. Repetition: While doing a big list of verb conjugations can get boring, this helps spice up really good repetitive practice. Wow. This has been a great year for blogging for me. When I started my blog in the beginning of the year, I didn’t anticipate having so many people visit my blog and so many followers. I am overjoyed each time I get a new follower notification, like or comment on any of my posts. Huge thanks to you all for your support. It means A LOT. 1. Monstruo: One of the many easy games I use in class. 2. Canción de la semana: “Mi Persona Favorita” por Rio Roma: Great song with lyrics. 3. Canción de la Semana: “Waka Waka” por Shakira: Classic. 4. Canción de la Semana: “ángel cruel” por CD9: Just like One Direction. 5. Los Colores: Neat way to practice the colors. Thanks again and I’ll be back in 2015 with some more ideas and songs! I love teaching colors. While most of my students know a lot, if not all, of the colors before they come into the class, I find so much excitement in using colors to describe things, like clothes. 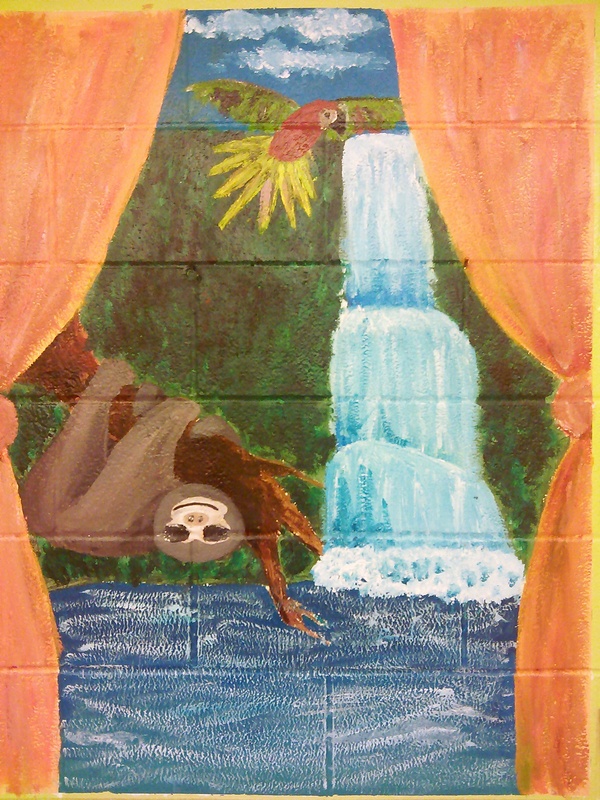 Of course, I also love giving my artistic students the chance to really shine. 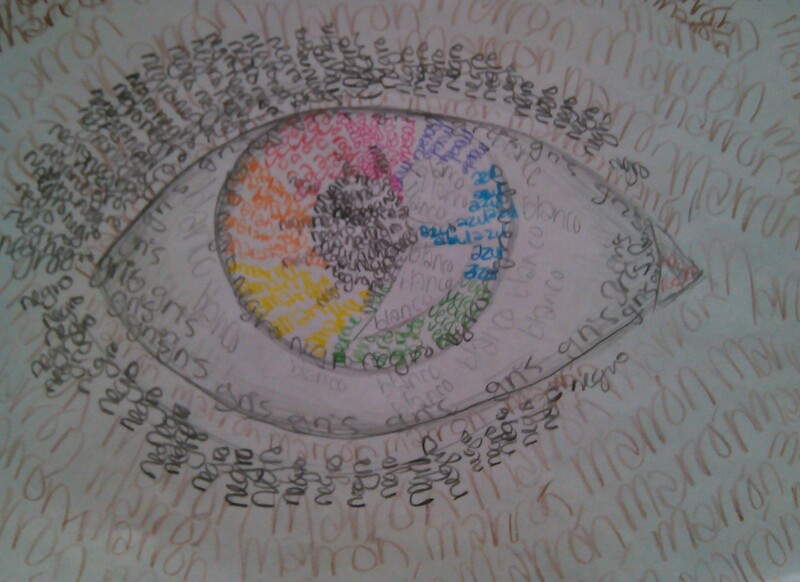 In the past I have used color-by-numbers to practice colors in Spanish, but last year I started something different. Take a look at this! The idea behind this activity is that instead of coloring their picture, they write the Spanish name for the color IN that color. 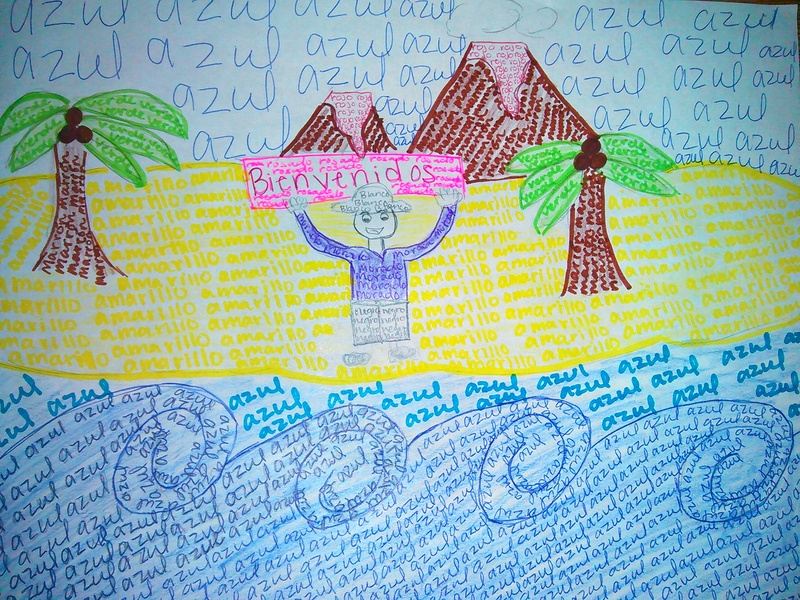 For example, the student who did the drawing above wanted blue waves, so instead of shading in blue, she wrote “azul” in blue. I love how creative some of my students were with this, and that, as opposed to a color-by-number, THEY got to choose what they wanted to draw. While I never read Maze Runner, I did love Hunger Games, and I know that a lot of my eighth graders have read and enjoyed these novels. 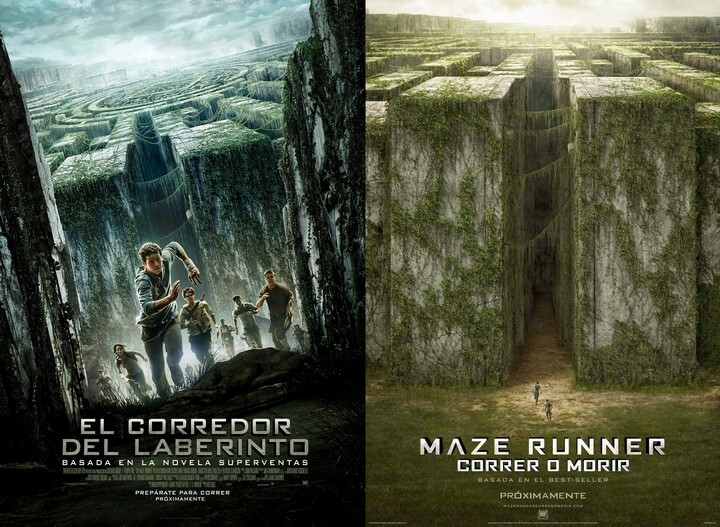 I stumbled across this activity to compare two Maze Runner trailers: one from Spain and another from Latin America. Please check out the link for a comparison activity to do with both trailers. Very cool! I immediately knew who I would pick: Mr. Peppercorn. He was my high school physics teacher who had become an educator later in life. Although I am not much of a physics fan, he really made class wonderful. He was so nice, and really believed in me and my classmates, even though the class was far from easy. He always told us that he would support us in any way if we ever decided to become engineers. I thought that was particularly powerful, because I went to an all girl school, and there are far fewer female engineers than male. Also, he mentioned once that every morning he gets to school, looks at all of his seating charts and says a prayer for us to have a good day. I was, and am still, so touched that he would take the time to think about us and wish for our happiness. Finally, in 2004 when I was a junior in high school, technology was not as frequently used as it is today. However, he used his own money each year to fund a webpage for the class. He would put homework info, extra help, and contact icons on his webpage. He told us that if we sent him a message, he would answer it within thirty minutes. Even today with my email hooked up to my phone, I am not sure I could make that promise! 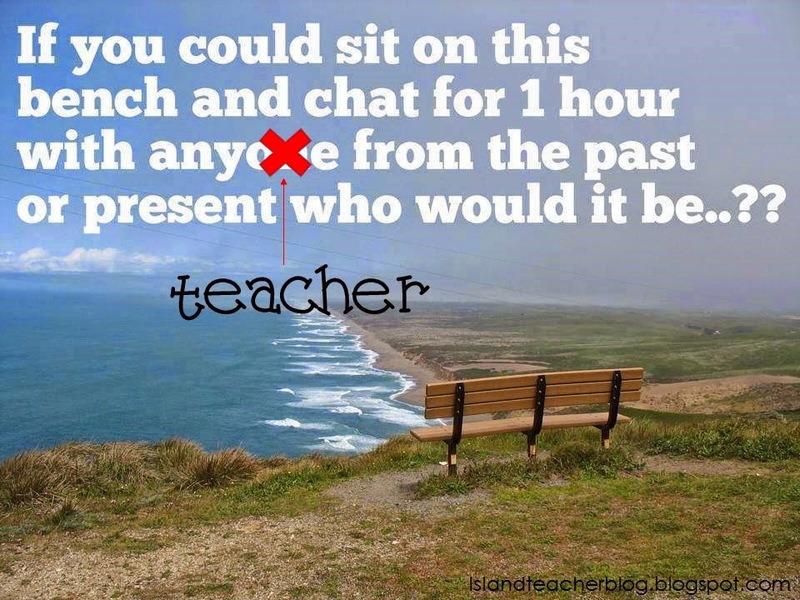 I would want to sit down and thank Mr. Peppercorn for inspiring me to go the extra mile for my students. Back in April, I went to the OFLA conference and came back with a TON of ideas I wanted to incorporate into my class. However, since the conference took place close to the end of the year, there was only so much I could/wanted to incorporate immediately. Over the summer, I started getting things ready for what Ms. Smith and Ms. Stidham talked about at the conference: reading! 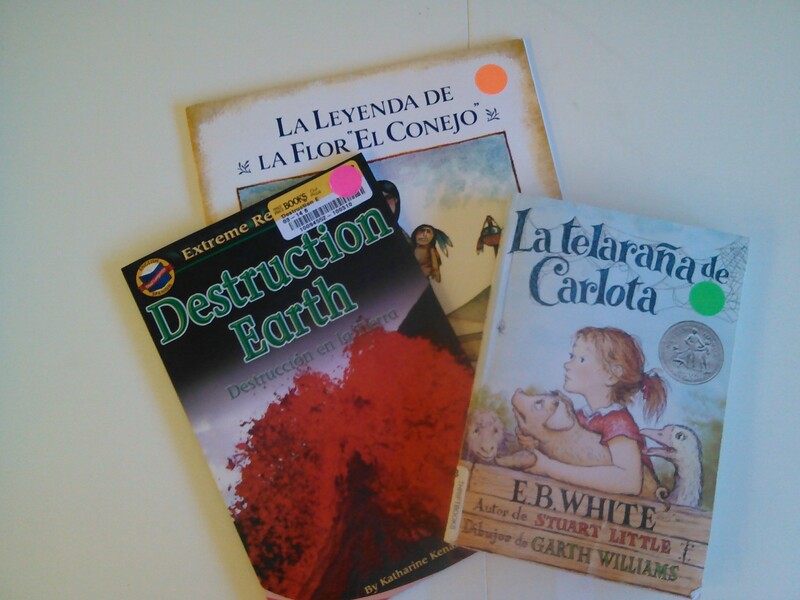 I started by collecting a lot of books in Spanish. I already had some, but I got the rest on Amazon. Most of the books were a penny, although shipping and handling cost a bit more. Also, my colleague purchased several books to add to the pot, which is a good way to share the expense. 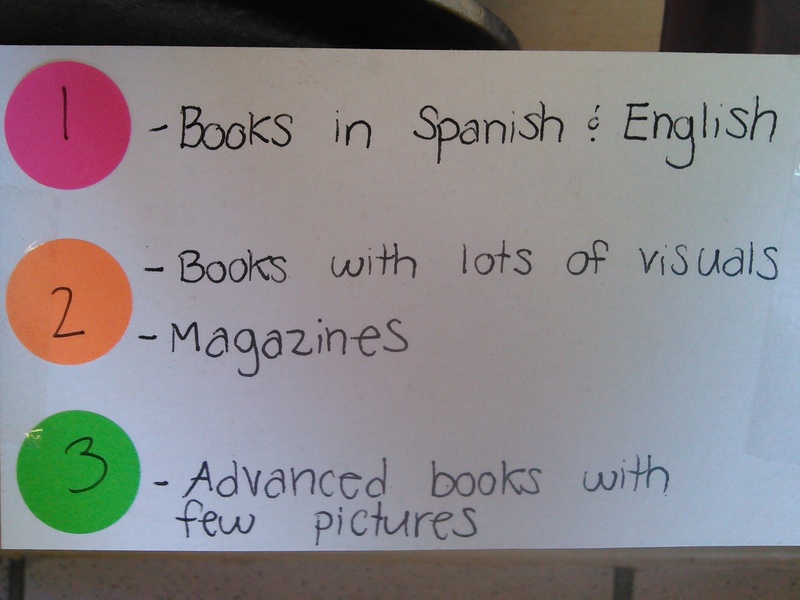 Then, I labeled the books with stickers: pink, orange and green. What the colors represent is depicted below in the picture. I’m planning to set aside just 5-7 minutes every Wednesday for reading. Students will have the opportunity to choose a book and just read. They aren’t going to write anything or take notes while reading; they’ll just simply read and absorb. Sometime after the reading session and before the next session I will review their words/phrases they learned and give them some feedback. I’ll let them know if they are right or what the correct definition is, but I’m not going to deduct points if they got the definition wrong. Also, I can check to see what level of books the students are reading by reviewing their log. This way I can make suggestions if I think they need to read more advanced books or more basic books. I’m hoping that this will get my students excited about reading!